Cell Etiquette: Yes, but are you listening? JAMES KATZ, director of the Center for Mobile Communication Studies at Rutgers University. …Gary, a therapist in Ohio who also declined to give his last name, citing the illegality of the devices, says jamming is necessary to do his job effectively. He runs group therapy sessions for sufferers of eating disorders. In one session, a woman’s confession was rudely interrupted. 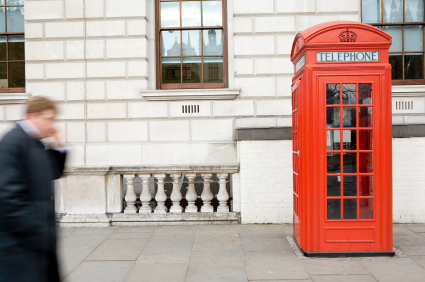 Not so long ago, the phone booth was the way that people shielded their calls from curious ears. In hotel lobbies, phone cabinets (with doors and seats) prevented your secrets from being publicly broadcasted. “Would you excuse me?” someone would say. “I’m afraid I have to take this call.” And the visitor would be ushered into the outer office while the executive covered the spread with his bookie or arranged a date with his cookie. If I take a call when I’m in a shop or restaurant, I step outside. At a friend’s house, I’ll step into another room — after excusing myself. And if possible, I don’t take the call at all, silencing the vibrating as quickly as possible. I’ll return the call later, in private. Can you hear me now? Yes, but are you listening? Enjoy the world around you, drive safely, engage your dinner companion in conversation, don’t interrupt the sleep of the guy next to you who paid good money for the flight, the same as you did. Unless it’s unavoidable, please put away the phone. This entry was posted in Living and tagged etiquette, Living. Bookmark the permalink. One Response to Cell Etiquette: Yes, but are you listening? It’s interesting how people can sit on a train together and say nothing to each other, avoiding contact at all costs. Yet once a cell phone goes off that person’s entire personal life becomes public knowledge whether the other riders would like to hear it, or not. There is no invisible sheild that contains a phone conversation in a public place. “There’s no etiquette”, and that’s a shame.